Seven dispatched Missions as CoPilot with Lt R.A Knight as Mission Orientation Pilot: 151(11 May 1944), 154(S), 155, 157, 158, 159 and 163. See Missions List for mission dates and target locations. 1Lt John H. Baker (P) - Dispatched on seven missions as CoPilot with a Mission Orientation Pilot. Other missions flown as the crew's First Pilot. Combat tour completed on 5 August 1944. 2Lt Charles W. Matthews (CP) - Flew no 303rd BG(H) combat missions. Transferred to 15th Air Force, 301st Bomb Group / 352nd Bomb Squadron in Italy in May of 1944 where he flew 10 missions as a B-17 copilot. He then trained as a P-38 pilot and flew 6 missions with the 95th Fighter Squadron. 1Lt Frank G. Belles (B) - Flew on 18 credited missions with Lt Baker, 1 mission with another Pilot (167) and 8 missions as a Lead Crew Bombardier with other Pilots (202, 203, 208, 215, 221, 222, 223, 243). Combat tour completed on 17 September 1944. T/Sgt Warren L. Kishbaugh (E) - Flew on 21 credited missions with Lt Baker and 5 as a Lead Crew Engineer with other Pilots (235, 237, 241, 245, 253). Most of his Lt Baker missions flown as Waist Gunner. Combat tour completed on 7 October 1944. T/Sgt Fred H. Judd (R) - Flew on 7 credited missions with Lt Baker (151, 155, 157, 158, 159, 161, 163). Was shot through the hip by flak, was given first aid and hospitalized after landing. 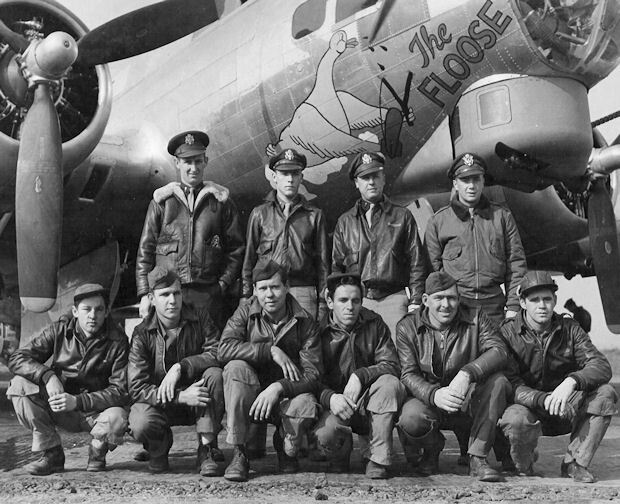 Flew no other 303rd BG(H) Missions. T/Sgt Archie R. Jennings (R) - Five missions (165, 169, 170, 171, 172). See Lt John H. Cook crew photo. Flew on 23 additional credited missions - 17 as a Lead Crew Radio Operator. Combat tour completed on 7 April 1945. T/Sgt Thomas B. Cottrell (R) - Assigned 358th BS 28 May 1944 - 18 missions with Lt Baker (Missions 177 through 220). Flew 5 credited missions with two other Pilots (165(A), 167, 171, 172, 175, 176). Last mission on 5 August 1944. Cannot locate photo of T/Sgt Cottrell. S/Sgt Joseph S. Bertasso (BTG) - Flew on all of the Lt Baker missions. Completed combat tour on 5 August 1944. Sgt Stanton A. Parker (WG) - Flew on 20 missions with the Lt Baker Crew (151 through 179 and 185,194, 201 & 205). Last mission on 17 July 1944. The Lt Baker crew flew with one waist Gunner after mission 179 on 13 June 1944. S/Sgt Fred P. Reichmann (WG) - Flew on 28 missions with Lt Baker. No other missions flown. Last mission on 5 August 1944. Missions prior to 13 June 1944 flown Top Turret Gunner. One mission as Tail Gunner (205). Other missions as Waist Gunner (186, 190, 200, 203, 208, 214, 216, 217, 218, 220). Last mission on 5 August 1944. S/Sgt Archie D. Peters (TG). Flew on all of the Lt Baker missions except for 205. Flew one mission with another Pilot (223). Combat tour completed on 8 August 1944.